Some people take years to figure out their passion. Luckily, David Carroll is not someone who took years to figure out his life’s calling. When he was eight years old, Carroll discovered turtles and his life’s passion – or obsession – began. 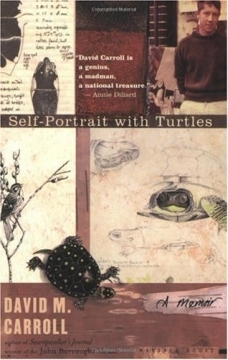 In Self-Portrait With Turtles: A Memoir, Carroll recounts his lifelong fascination and study of turtles. Regardless of your specific interest in turtles or nature, Carroll’s memoir is well-written and engaging. In 2006, Carroll won a MacArthur “genius” award for his work as a writer, artist and naturalist. via To Be Read – Self-Portrait with Turtles: A Memoir.